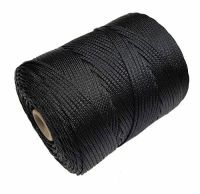 20mm 3-strand Nylon Rope sold cut to length by the metre. Please enter the length you require in metres in the quantity box. If you would like more than one length of this 20mm nylon rope, please order the total length in metres and when checking out put a note in the 'delivery notes or comments' box about the individual lengths you require. MBL 8000kgf - NOT Test Certificated.